That being said, Budapest Hotel does reiterate typical Anderson themes of young love, surrogate family, and absolution through forgiveness. You will also find Anderson’s typically precocious, stone-faced on-screen inner child, this time in the form of Zero (Tony Revolori), a lobby boy in a posh Turkish hotel in 1932, who forms a strong bond with his boss and mentor, Gustave (Ralph Fiennes), the finest concierge of his time. However, even Anderson’s usual tropes are nuanced. Incorporating the period between world wars as a backdrop for most of the action, the film develops a deep resonance, greater than any of his previous nostalgic fantasies. What might have been somewhat breezy emotional manipulations in previous films are grounded by a palatable sense of doom and a melancholic empathy for men who weren’t made for the times in which they live. Anderson has always delighted in showing off his incredible imagination, but he has never been more dedicated to the awe-inspiring perfection of every facet of a film than he is here. He designs the world of Budapest Hotel with Kubrick-like precision and virtuosic flair, a dizzying explosion of brilliant colors, playful visual effects, and disruptive editing. Actors anachronistically use their own voices instead of ones more appropriate to their characters (Edward Norton, for instance, uses his soft-spoken, All-American accent while playing a German Army officer). Practically every frame contains a visual joke or a reference to other films. 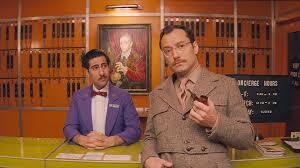 Wes Anderson has always been in love with cinema, and you can practically feel what a joy it was to create this movie. The script, too, sparkles with the same impeccable energy. By far, this is the most polished, well-crafted and beautifully written work of Anderson’s career. Sometimes painstakingly poetic, other times endearingly profane, the crackling wit and banter of this film (particularly in the first half) stands alongside the best of the Howard Hawks screwball comedies that seem to have, in part, inspired the script’s style. Accordingly, the dialogue is delivered at a blistering pace, a sort of Shakespearean screwball rapidity that is almost exhaustively energetic. Proudly displaying such intelligence and respect for the audience, Budapest Hotel should make standard Hollywood comedies ashamed of their own stupidity. If Budapest Hotel it is not Anderson’s best movie (it’s hard to tell if Rushmore is better or if Anderson’s sense of nostalgia is so profound that it’s infectious), it is certainly his most mature. Still, there are some predictable road bumps for folks who don’t typically favor Anderson. A recurring bit may go on too long, his penchant for cartoonish fancy takes over more than once, and one choice of actors felt a little too obvious for a film that casts every other role so idiosyncratically. These are all minor points that, to Anderson fans, may even serve more as high marks rather than demerits. I must admit that I have not been the biggest fan of Wes Anderson, but Budapest Hotel is a wonderful experience, and, for the first time in a decade, I look forward to his next film. Hopefully this is a signal that he has exorcised some of the more vain conflicts he has repeatedly investigated in his movies. Budapest Hotel is the work of a director who is self-assured, not self-absorbed. It is the work of a man who conceives a world outside himself. Dude, this review may have almost convinced me to see a Wes Anderson movie. I hope your happy! !